Firms Skin And Reduces The Look Of Fine Lines And Wrinkles Every Day. Anti-ageing lightweight moisturiser with broad UV protection designed for for face, neck & décolletage. Hydrates to improve elasticity and firms skin for a lifted look. Protects from the damaging UV rays. With Pentapeptides & Vitamin E. It Helps Exfoliate, Smooth And Revitalize The Look Of The Skin. 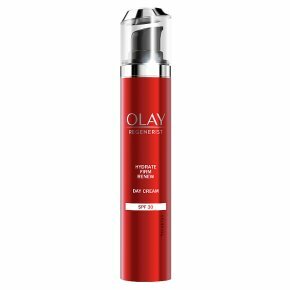 Olay Regenerist 3 Point Anti-Ageing Firming Day SPF30 Cream is a moisturiser with lightweight, non greasy and skin-plumping formula. It firms skin for a lifted look and reduces the look of fine lines and wrinkles while protecting from the damaging UV rays. Hydrates to improve elasticity and helps exfoliate, smooth and revitalize the look of the skin. Designed for face, neck & décolletage. Supercharged with advanced Amino-peptide Complex II, Regenerist 3 Point Day Cream SPF30 regenerates skin?s surface cells and delivers anti-aging ingredients 10 layers deep into skin?s surface to help retain its youthful look. It contains Pentapeptides & Vitamin E.
Smooth evenly over your entire cleansed face and neck before sun exposure.